For information about the Taos Writers’ Conference, visit unm.edu/~taosconf. Learn more about the online classes and teachers at mynm.us/unmrananim, and check out the Rananim video at mynm. us/rananim. Get the details on visiting the D.H. Lawrence Ranch at taoscf.org/dh-lawrence-ranch. Home can be a fluid concept. Just ask Sharon Oard Warner, who grew up in 16 different Dallas houses. (Her mother had a thing for fresh starts.) Albuquerque has been home since 1994, when she was hired by the University of New Mexico’s English department to teach fiction writing. She’s lived in only two houses here, one in Taylor Ranch and one in the North Valley. “My husband moved a great deal as a child, too—his stepfather was an Air Force pilot—so we are both all about ‘blooming where you’re planted.’” New Mexico has proved to be a very fertile ground for her. In 1998, she launched the now world-renowned Taos Summer Writers’ Conference, and has been the director since then. Each July, weeklong classes in fiction, memoir, poetry, and more, taught by acclaimed writers like Pam Houston, BK Loren, and Dani Shapiro, attract writers from near and far. The organization was also conceived with a mission to support and sustain Taos’s D.H. Lawrence Ranch, an area attraction second only in visitor center inquiries to Taos Pueblo. Lawrence and his wife, Frieda, called it home in the mid-1920s (it was the only property they ever owned), and, thanks to a donor, the ranch is now open to visitors on Mondays, Wednesdays, and Saturdays from 10 a.m. to 4 p.m., after being closed for years. At UNM, Warner is an English professor and the associate chair of undergraduate studies, as well as the special assistant to the dean for the D. H. Lawrence Ranch, which was bequeathed to UNM by Frieda Lawrence. Warner edited the anthology The Way We Write Now: Short Stories from the AIDS Crisis (Citadel Press, 1995), published her own collection, Learning to Dance and Other Stories (MVP Books, 1996), and released the novel Deep in the Heart (Simon & Schuster, 2000). In Sophie’s House of Cards, Warner’s engrossing new novel set in Albuquerque and Taos, Warner investigates the ways that home and family are defined and discovered by her characters, including Jack, who seems to prefer renovating a rental property to spending time in his own home; Peggy, whose most influential relationships were formed on a Taos commune; and Sophie, their pregnant teenage daughter, who considers a very unusual option as she ponders her next move. Along with the family-drama dynamics, the book is also guided by the structure of a tarot deck spread, with a portentous card kicking off each chapter. 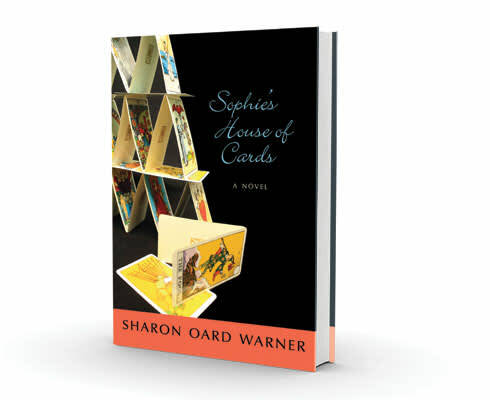 There are no saintly figures in Sophie’s House of Cards; Warner’s characters are selfish, impulsive, quixotic, sloppy, avoidant, and moody—at the same time that they are well-meaning, forgiving, generous, tenderhearted, and loyal. Since most of us are walking around feeling less than perfect, it’s valuable and heartening to witness these characters muddling their way toward transcendence—and finding their various ways home. How did New Mexico influence the writing of this book? One of the things I wanted to do most was write about New Mexico as a setting, to try to bring Albuquerque and Taos to life as destinations as well as places to live. There’s a vastness and grandeur and history to New Mexico, a long history that envelops the state. In Albuquerque, the architecture is confounding—how the houses are often built behind each other, in a line, in compounds. You don’t see that in other places, and you can bet that the UPS delivery drivers have a tougher job there than in cities with more traditional developments. The acequias, the plants, the animals— they’re all very unique to the area, and charming and surprising to people who come here for the first time. And Taos has a history as a place to get back to the land, as a magnet for the commune movement. I lived through that time in Haight-Ashbury. I researched Taos by reading Scrapbook of a Taos Hippie: Tribal Tales from the Heart of a Cultural Revolution, by Iris Keltz, and by talking to people in Taos who participated in its communes. I’ve had several students at UNM who are the children of those Taos hippies—one of my students was named Flame Bojangles Night Sky! He and other children of hippies wrote about their parents and growing up on communes. Reading these stories gave me an opportunity to see that when you’re in your 20s, your ideas of being a good parent aren’t necessarily what you think are good ideas later on. The older you get, the broader your experience is. You have to grow into it. In Sophie’s House of Cards, Peggy certainly meant well, but maybe all of her decisions weren’t the ones that served Sophie best. I remember writing descriptions of the sky over and over again, the vastness, and the color, and how it’s so different here than other places. There are opportunities for description and setting that I certainly didn’t have when I lived in the Midwest and in Texas—the beauty of the landscape and the richness of culture. What were some of the other elements? I was trying to explore the idea of what constitutes a family. It doesn’t necessarily have to be a traditional nuclear configuration, and family members don’t need to be blood relations. It can be defined in all sorts of ways. I also wanted to write a book that hangs on a tarot reading because I’m interested in structure. Annie Proulx used a series of nautical knots for The Shipping News, and in How to Make an American Quilt [by Whitney Otto], each chapter was based on a kind of quilt, with a related subplot. What made you decide to include the tarot deck as the structural element? I was born and raised in Dallas, but when Iwas18 Igot on a bus and went to San Francisco, where I had a job waiting for me as a live-in babysitter. The mother wanted to take a semester-long tarot class at the College of Marin, and asked me to take it with her. It was pretty detailed. That was my grounding in the cards, but I hadn’t done anything with them since. And so I knew enough to use that theme. I began by writing character-development scenes. After I wrote the scene where Peggy is reading Sophie’s cards, at that point I knew I would attempt to write this book, whether I got it published or not. How did Taos Summer Writers’ Conference come into being? My English department chair asked, “If you were going to have a project, what would it be?” And so I said, “I would found a writers’ conference in Taos and connect it to the D. H. Lawrence Ranch.” He replied, “Great idea, do it!” Oh, hell, I thought, now I have to do it. I didn’t have long-range plans for it; I just began doing it on a year-to-year basis. But it quickly became a really growing conference that took off in ways I didn’t expect. If I’d ever written a novel as successful as the conference, that would be great. It’s the most successful thing I’ve ever created—yes, because it’s well-organized, which is important, but also because it’s in Taos, and that brings people in. It’s an artistic mecca. For 16 years, people have been coming from all over the world: Australia, South Africa, Norway, Great Britain, Canada, Italy, Spain, New Zealand. We’ve even had people who’ve come to the conference as instructors or participants, and were so intrigued that they moved here. Hilda Raz, from the University of Nebraska, came here to teach. She retired and moved here. Now she’s the poetry series editor for UNM Press. Margaret Wrinkle came as a student while she was drafting Wash [which became an award-winning novel lauded by the New York Times and the Wall Street Journal]. She finished the novel and moved to Galisteo. Tell me about your new project, Rananim—a new series of online Taos Writers’ Conference classes offered throughout the year. It’s named after D. H. Lawrence’s term for the creative, utopian society that he wanted to form. I conceived of it as a way of bringing attention and a revenue stream to the ranch, which has been a financial burden for UNM over the years. It costs $35,000 each year just to keep the roads open and do minimal caretaking. But it’s also a potential asset, an international cultural property. The online classes have less overhead, so more proceeds can be funneled into upkeep for the ranch. I’ve always thought that it would make a wonderful site for a residency program like Yaddo or Hedgebrook, for writers, artists, musicians, composers, and all kinds of artists who could spend time doing their work and cross-fertilizing. It has a real history and interesting standpoint anthropologically, archaeologically, architecturally. But the residency is most important to me, because it fits the vision Frieda Lawrence had when she donated her home to UNM. Managing editor Candace Walsh is the author of the NM-AZ Book Award–winning Licking the Spoon: A Memoir of Food, Family, and Identity.